I am very passionate about sewing. It has been in my soul for over 40 years. It has seen me through happy times and very depressed times. It has taken me on wild adventures and soft wanderings. It has brought me peace and tranquility in very stressful times. 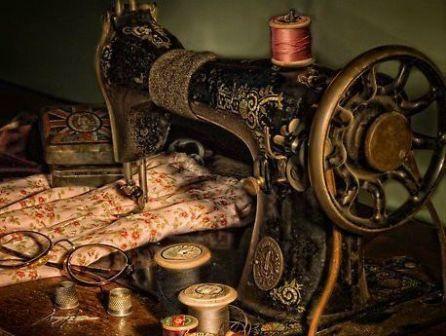 I think if I had to give up everything but one, I would keep a sewing machine. (Or at least a needle and thread). 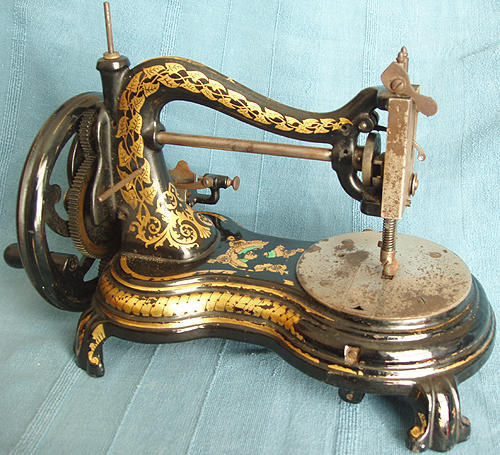 I love the modern improvements to our present sewing machines. Sewing has become so much easier. 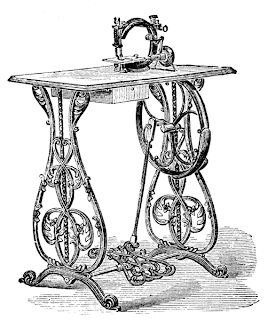 The machine will sew buttonholes at a press of a button. They will sew the button on as well. Home sewers now can do their own embroidery by machine, lovely monograms, whole scenes with just a press of a button. The machines even thread their own needles and cut the threads. I could go on and on, it really is amazing. And then there are all the gadgets you can get to make your life as a seamstress easier. I have to keep telling myself to embrace those new gadgets and stop trying to make my life so difficult. There are pleaters, bias makers, bias cutters, gadgets to go over jean seams smoothly, rufflers just to name a very few. But, I also love the antique machines. They were really works of art, beautifully trimmed in gold painted scroll work. Some were adorned with brass fittings and filigree. There were small ones and large ones and they all made items the woman needed in her life. The tables these machines sat on were beautiful as well, scrolled iron, heavy and strong. Sure they were slow, but they were methodical. The first being foot powered, a gentle rocking becoming a soft rhythm. Then came motors, still slow and steady, providing a low hum. The woman watching her beautiful fabric become a work of art. And the fabrics then were gorgeous. I had a friend that made her whole square dancing outfit on an antique treadle sewing machine. It was wonderful. Each improvement meant the woman could see results quicker. She could experiment more. And that has continued right up to today. I am amazed at how wonderful old world crafts have been taken into the modern world. Quilting comes to mind. Yes, we can still appreciate a well stitched quilt, all hand done in tiny even stitches. Those are priceless to me. But, I have seen some gorgeous creations at quilt shows done with computers and sewing machines. These are just as much quilts as the hand done ones. I am slow to come into the new world of machinery and gadgets. It isn't because I don't find them wonderful, it is because I haven't taken the time to try them. Perhaps one day, in my spare time (grin). But one thing is for sure, as long as we have a needle and some thread and a piece of material whether new or old rags; we can create. And with that creation we can find pride and solace. So whether it is with your hands, or a machine or a computer, or all three; keep creating. 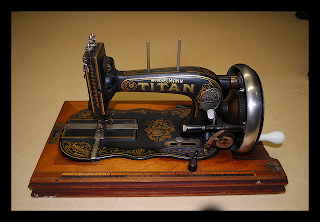 I promise to try new gadgets if you will and together we can hold onto our craft, the skill of sewing. And be sure to pass the treasure of sewing on. Happy Monday to all of you. I hope you had a great weekend and that you are well. I awoke to glorious sunshine and bright blue skies. That always makes me smile and sets me up for a fabulous day. I truly am a solar girl. Last week I spent Spring nesting. I had company coming for the weekend and needed a guest room. Sadly the guest room had become a storage room for all my treasures I have collected over many years. I can now say that it is now a wonderful guest room and I am thrilled to check that off my list. It was long over due. Moving boxes and totes and baskets filled with things of course required being organized. It also resulted in moving around other things in other rooms. Which led to transitioning my bedroom from Winter to Spring, making it light and fresh and airy. Now the house is clean and neat and tidy and fresh. It makes me smile, giving me a huge sense of accomplishment. Now it is time to get back to business. I need to make up for those busy cleaning days. I have 5 little bitty naked ceramic dolls waiting to be clothed. Also have a wedding party coming this week for alterations. 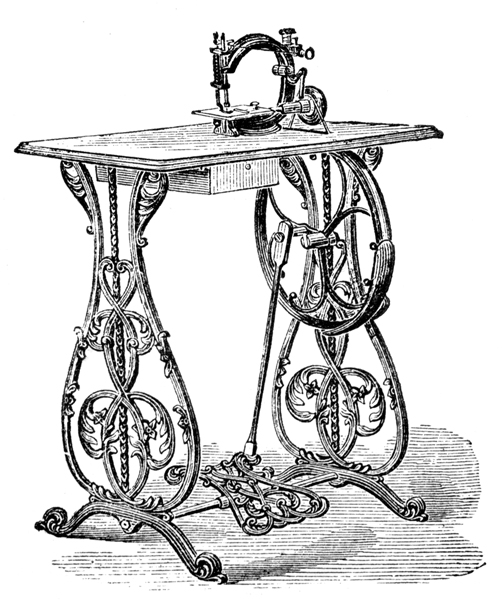 It will be nice to sit down at the sewing machine without too many interruptions. It is much easier to sew when you can follow the flow. Here are the pictures of the last set of dolls I completed for my client. It is funny, I never thought I would be sewing for dolls when I turned my sewing into a business. But it has been a fun and profitable side path. I will admit those little tiny armholes can be frustrating at times, but with a deep breath and patience they always turn out perfect. It is great too, that my client gives me freedom in dressing the dolls. We have worked together enough that she knows I am on the same thought process as she is. That is a good partnership and a big compliment. Hello to all of you. I hope things are fabulous with each one of you. I believe I have caught Spring fever. We haven't had to deal with very much snow here, so we have seen the grass for some time now. Of course it is brown and boring, but it has given me cause to plan and dream of planting and gardening. Naturally my dreams are much bigger than my energy levels and pocketbook, but I haven't let that stop me. I want to know what is in and on my food, so I will be planting a vegetable garden this year. I would love to turn the whole yard into a food source. Somehow that doesn't seem possible all by myself, so I will start small....lettuce, tomatoes, cukes, zucchini, summer squash, spinach, pole beans, carrots, maybe some green onions ro chives. I also have 3 blueberry bushes that have been paitently waiting to get into the ground. And then perhaps some herbs. Of course it is a natural progression to want to can and freeze for the winter. Mind you, I have never canned before, so this will be an adventure. Now onto the flower part of my plan. I have a wooden fence about 5 feet tall at the back of the yard. My plan is to start planting floweing trees and bushes all along that fence area. 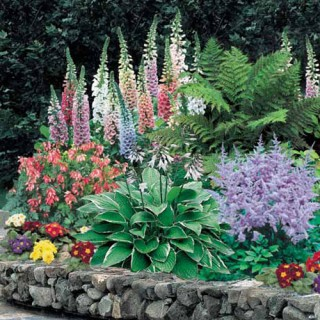 Because I tend to be a little impatient, I will want to purchase pretty mature plantings. This might take a few years and a lot of sewing clients. Heh! Pinterest and Facebook can be evil habits, as I have found a perfect vision of this fence area. 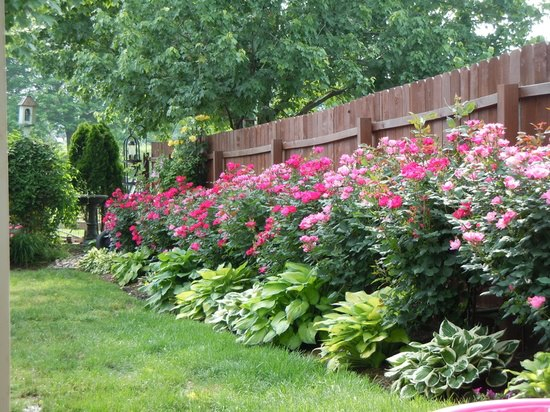 They use gorgeous rose bushes, which isn't a bad idea either. If I use the roses, they won't be tall enough to hide the view behind the fence, which is an excavating business. But we will see. Then there are two maple trees I would love to surround with ferns and shade loving plants. Perhaps a bench to rest oneself would be nice too. And the biggest project of all is to make some sort of steps from the driveway at the side of the house to the front door. I am thinking of useing railroad ties and very slight graded steps. Now mind you...all of these projects will have to be done by lil ole me. As I said in the beginning, my dreams always outweigh my energies. But, I figure if I take it a little at a time, it can happen. Right? Now that is the outside dreaming. Inside I am well under way. Company is coming for the weekend. What better motivation to clean up the spare room and turn it into a lovely guest room. The spare room was packed full of boxes and totes of collections, dishware, and stuff. It is almost cleared and ready for the bed, curtains and decorating. It will be so nice to have it all done. Then in a few weeks I will begin work on turning a small room off the driveway into a shop. It will be so exciting to have a physical shop for Simply Rebecca Studios with regular hours. Here I will welcome my custom clients as well as sell my one of a kind items. I think I am going to be a busy gal, but it will keep me out of trouble. And busy hands definitely fills the heart with joy. Sewing, digging in the dirt, and making things pretty all stir my soul. They make me happy. It is going to be a fabulous year, I can just feel it. I wish the same for all of you. Find something that calls to you, that sings inside of you. Then just do it. Find the time and the means to answer that call. You will be surprised at the results. It will give you more energy and motivation to do more.